Autism is in the news. My Name is Khan was released last weekend. The movie takes on some important topics (Asperger’s, religion based profiling). The movie was very average, but any movie with SRK in it is automatically big news. The other big news is that the American Psychiatric Association has recommended that Asperger’s Syndrome (AS) be dropped from the DSM (Diagnostic and Statistical Manual of Mental Disorders). Asperger’s Syndrome will be subsumed under Autism and will disappear as a separate diagnosis altogether. The change is welcome, because careful study of people with Asperger’s has demonstrated that the diagnosis is misleading and invalid, and there are clear benefits to understanding autism as one condition that runs along a spectrum. Several NYT readers have written in, most of them against such a move. Elsewhere, a new movie about Temple Grandin, an autistic inventor and writer was released by HBO this month. All in all, a very active month for Autism. Which is good. My son, Naren, has Asperger’s Syndrome. We welcome the light that is being shone on Autism and AS. Autism is not well understood in schools and by the general public. Since the most important deficiencies among Aspies (as they are called) are social deficits, and the incidence of Autism is the highest it has ever been, society benefits from a better understanding of Autism. In the US today, 1 out of 150 kids get a diagnosis of Autism. That is a very high incidence of a disorder of any kind. In fact, there is some thinking that the genetic traits that are responsible for Autism are far more widespread than we think. In many people, the compulsive need to create order is actually a symptom of a muted Autism trait. Tyler Cowen an economist has a book out which is partly about the need for Autistics to impose order on a disorderly world. The question arises as to how Autism traits could be so widespread in the face of evolution and natural selection. The answer, some people suspect, is that in some ways Autistic traits can offer benefits and therefore increase evolutionary “fitness”. Undeniably, there are many talented and famous people who, it is thought, were Autistic. Albert Einstein and Emily Dickinson, for instance. Vernon Smith, a Nobel prize winner in Economics, considers himself to be autistic. A five minute interview of Smith on CNBC is here. That Autistic children can be talented is not something I need convincing about. 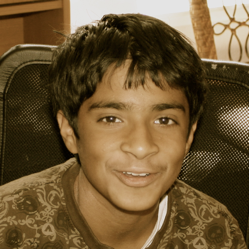 My son Naren was identified very early as a GATE student (gifted program in California). In eighth grade, while he was having all his problems at school, he was still pulling straight As in his Honors courses. He writes with clarity and maturity [the link was wrong. fixed now]. And he is a talented musician. He plays the piano, the trumpet and the guitar and has composed four delightful pieces for the piano. Here’s one. We are so proud of Naren’s achievements. But Naren also has problems. Like most autistic children, he doesn’t automatically learn the norms of social interaction. He stands out in a group of children. His interests – music, DC comics, manga – are deep and narrow. He has no interest in sports. It’s tough for him to make friends. In middle school, Naren also started showing behavior problems. Teenage and Asperger’s didn’t mix well for him. Many things now frustrate and anger him. Last year he started having anger outbursts. The problem grew to where the school district didn’t think he could continue in mainstream education. We disagreed and are negotiating for the placement we think he deserves. We know Naren will get better and be successful. He is of course, getting the inputs he needs – doctor, therapy, group work and a lot of love and support from his family. But most importantly, Naren himself, really wants to get better. Till very recently, we never got a definitive diagnosis of AS from any doctor. Naren’s AS is typical in many ways, and atypical in others. But now, a clear AS diagnosis from both his doctor and neuropsychologist is actually a relief. That is the power of a category, or a label. Naren can now be told that he is an Aspie. He and we can now relate his condition to thousands of other Aspies. We are now part of the AS community. The resources – treatments, therapies, books, online support – available to AS kids are now available to Naren. As a descriptor – Autism is just too broad and fuzzy. On the other hand, Asperger’s is a single word that gets you very much in the neighbourhood of where Naren is. Which is why we will keep calling it Asperger’s regardless of what they do with the DSM. I suspect most people with AS will too. People want to identify with a group with shared characteristics, which is why the group is formed in the first place. If those characteristics are shared weakly, the strength of the group identity weakens too. This entry was posted in Uncategorized and tagged Personal Updates. Bookmark the permalink. Dustin Hoffman played the role of an Autistic Savant in the movie "Rainman" – that won him an Oscar way back in 1988, I guess. That was when I first got some clue on what autism is about. c)Too much of micro-segregation would promote in-breeding as opposed to the desired levels of diversity sought to be attained eventually to end forced isolation/excessive introvertion. In a way, it also offers an opportunity for the broader society to willingly blend such diversity in and break its stereotypical monoculture. d)Gaining the power in numbers. A larger super group will always have a higher negotiating power than a smaller sub-group as might face ostracization underservedly, especially for someone as gifted as your son. Under your loving care and support, I am sure he'll learn to cope sooner. In time, the society too will. Very nice post Basab. Perhaps your best so far on this nice blog. I am not sure I know you, just got this post forwarded from an ex-colleague at Infy. It's really brilliantly written – your way of writing about deep personal experiences is very warm and touching, but not unnecessarily dramatic. Wish you good luck with everything. Personally, whatever I know of autism is mostly from a close friend who graduated in special education from Columbia's Teachers College, and now works with a non-profit that primarily "trains the trainers" in municipal schools in Bombay. You might already know about the novel "The Curious Incident of the Dog in the Night-time" – I read it on her recommendation, and found it to be an absolutely fascinating glimpse into the world of autism, unlike any other novel I'd ever read. I wish more people read that book than watch TZP or MNIK. I agree with the other's comments, I think this is by far your most deep post and conveys so much. Wish your son a speedy recovery Basab. I had earlier read even Vidya's post on this on her blog in 2007 (I follow both your blogs) and I am sure Naren is going to be be just fine with all your care. Many times we/I forget that the bloggers in our blog-rolls are also human; with the spirit to face what life throws at them. Having read your blog posts for a while, I must say this is one post that brings out the human face. A nice post indeed! A truely remarkable post from you …but I strongly feel that Autism is not a disease but a mental inclination of the Developed American Society wich watches every human activity so keenly . Bring the same child to India and you will find other kids will appear more diseased than him , because thats the natural state of Children specially kids from innocent lands . American society coined the word Gay for what Indians and world over calls Dosti / Brotherhood. American society calls a kid autistic whom Indians regard as Original Gems . I am sure Amir Khan and other great artists in India would have been easily and in no time been labelled as something …..by the cruel American society . very nice and solid post on this particular subject and well narrated also which binds the reader till the end. very thought provoking post , your son looks perfect to me . Basab where are you from back in India ? I mean where were you born and brought up …just curious to know . 2012 is being considered by many as the dawn of new consciousness or thinking all over the world when the mainstream western way of thiking will take a huge beating and with it the Dogmatic preachings of western medicine like Aspergers and autism will aslo be shunned .The very basis of these two diseases are based on a falacy . Basab its quite possible that your son is perfectly normal as per Indian traditions and culture and its that in a multi clutural US school he is being singlled out . So untill you see any real signs of self harm or violence dont consider what doctors in America preach as truth . Its important to analyse it from your eyes and belief system to instill faith in your son about Indian values and strenght of Indian culture and let him know that an Indian soul often gets lost in an alien country , it happens with strongest of indian adults ( note Indian adults in US dont lead a active social life anyways , even though I have been working in US for years we lead a professional life where the social interaction with foriegners are no so penetrating and intense so we are not evaluated so critically ) and he is after all a kid who is in midst of so many foreigners and you know in US schools the culture is quite wild and cruel. Let me know if my comments appeal to you a bit .I am trying to create an awareness amongst Indian parents based on my bserbvations . I have been following your blog since you were at Gridstone, found many posts very interesting and with fresh perspective…but this post is a stand-out, deeply moving and heartfelt. Thank you, Basab, for this post. And thank you, Naren, for the delightful piece – I'll get Rahel to listen to it when she's back from school. Yes: "The Curious Incident of the Dog in the Night-time" – I must've gifted a dozen copies of that to friends. Thanks Basab, for this post, and giving more meaning to this less-understood topic. I can understand since I too am a mother of Manas (15 year old boy with Aspergers Syndrome). What really hurts is that the people around are unable to see our children beyond their eccentricites. Things are changing here too with increasing awareness and also films like TZP and MNIK. My take on the film: It was unlike many contemporary Hindi movies which resort to melodrama and commit several and serious bloomers,This film has steered clear from cheap parodies which goes on to explain the massive amount of research that has gone into making the film. As a parent, caregiver and an activist in this field, I commend the filmmakers for making a commercially appealing sensitive film sans any melodrama. I want to share the lessons I have learnt from the film MNIK as a parent. NOTHING IS IMPOSSIBLE which is so very true for our children. People may label our kids with unflattering adjectives, but we must make them believe that they are good and capable of wonders. It is only with unconditional and non-judgmental love and empathy that we can bring about a change in society. We need to concentrate on all those tasks which we are capable of doing well and learn to live to our strengths and make weaknesses redundant. Learn to identify people who can understand us and accept us as whole individuals who will help us in our journey forward. This is directed at the posters who blame the U.S. culture for "diagnosing" autism. I am an aspie of Indian decent raised in the U.S. I was born in the late 1970s and raised in the 1980 when Asperger's wasn't on the radar screen even in the U.S. However, I was diagnosed as emotional disturbed and placed in special education classes. I've had MANY Indian adults tell me that in India, I wouldn't have been diagnosed or "labeled' BUT physically beaten to death by the teachers for "behaving" inappropriately. Shame on you for blaming the U.S. culture! In India, odd behaviors are cured by a good hard blow to the head with a wooden paddle which can easily result in death!